Actress Kim Hee Sun has been chosen as the ‘Beauty Icon’ of Asia. She will be attending the 9th Cosmopolitan Asia Beauty award in Shanghai. Cosmopolitan Asia Beauty Award is a major event that gets called as ‘Fashion Oscar Awards’, and it has been treated as the most prestigious fashion exhibition for the many years China. From last year, they invited Korean and Hong Kong stars to the event, and recognized three top stars. Especially, ‘Icon of the Year’ award is considered as the best highlight of the entire event. According to a local official, Kim Hee Sun’s recent drama SBS ‘Faith‘ is growing largely popular in China. On the other hand, Kim Hee Sun will be leaving to China next month after finishing shooting ‘Faith’. See why Kim Hee Sun was chosen as the Beauty Icon Of The Year at our photogallery. Is Kate Tsui the Reason For Leon Lai’s Divorce? Rumors have surfaced among tabloids that Leon Lai and Hong Kong TVB actress Kate Tsui are possibly reconciling after they appeared in Shanghai together last week. The two initially met in 2005 and were romantically involved after working together on a commercial. It is said that once Gaile Lok knew about the relationship, she was adamant about a divorce and that’s when the Leon decided to distribute some of his assets to her to keep the relationship secret. Taiwanese actress and pop singer Ruby Lin has always prided herself on her marketing value as a spokesperson considering her popularity as an actress, however, she is horrified when her photo was used for advertising hymen repair surgery, so much so that she has filed a copyright infringement suit, according to Jayne Stars. It is understandable that Ruby is upset, as the copyright infringement has already lasted for 2 years. The suit for unauthorised use of Ruby Lin’s photo online for hymen repair surgery was mounted against Beijing Greene Hospital, and the trial began yesterday morning in the Court of Chaoyang. Ruby is requesting damages for the use of her image without her consent as well as an apology. Based on accepted celebrity spokesperson fees, the lawyer said she will be suing for $500,000 RMB, plus $100,000 RMB for mental distress. In their defence, Beijing Greene Hospital claimed that although the website has their name on it, it is not affiliated with them. They claimed that they have never administered nor accessed the site. The other day, Kevin Cheng injured his right eye, bursting the blood vessels, while shooting for Mainland drama Ip Man. He immediately stopped working and flew back to HK for surgery and treatment. Virgina Lok appeared at the Tsuen Wan Adventist Hospital to handle the paperwork for admitting Kevin into the hospital. She said: “I got a call and learned of Kevin’s injury. He’s a little frustrated, perhaps because he’s in a lot of pain and has to come back to HK alone.” Because of the accident, Kevin loses over a million HKD worth of canceled jobs. Yesterday at 1pm, Kevin was wearing an eye patch and sunglasses as a white car pulled up to the hospital to pick him up. When reporters asked about the accident and what exactly happened? He did not respond. Kevin later accepted an interview over the phone, “I got 10 stitches, the doctor said he used a very thin thread for the stitches and the scar should be very small. That’s why I had to get more stitches. I think by next week, when my eye stops swelling, I can start working again. There will bound to be accidents in filming, luckily filming for the series is almost complete. I’m in a hurry, I want to go back and finish it up. (Worried you might be disfigured?) Can’t worry or think too much. It has already happened, just got to deal with the circumstances!” Virgina expressed Kevin did not have to do a resurfacing surgery, but will have to go in for a followup visit next week to remove the stitches. Good friend Ben Wong accompanied Kevin to the hospital, he expressed Kevin is doing fine and is still handsome despite the 10 stitches. Kevin Cheng sustained an injury to the corner of his right eye yesterday during the filming of Ip Man. The injury was severe enough to warrant a stoppage in filming and Kevin was rushed back to Hong Kong for treatment at the hospital. The accident occurred during a martial arts fighting scene. Initially, it was suggested that Kevin go to Shanghai for treatment. However, Kevin wanted the doctors in HK to treat him instead, so the crew immediately bought an air ticket for his return. When Kevin landed in HK, he was rushed to the hospital immediately for surgery and may need to get stitches. Ip Man’s producer explained the situation: “Earlier when Kevin Cheng was first invited to take part in this drama, he loved the script, but was hesitant to accept it because he had been working nonstop for 20 months. He was worried he won’t be able to physically handle it. Now, filming of Ip Man is wrapping up, there is only ten days left and the fighting scenes are the main focus within these ten days. I believe he truly is exhausted, that’s why this accident happened.” The producer expressed when Kevin got hurt, it was like a bolt from the blue and the crew stopped filming immediately. The health of each and every one of the actors are important. “Artists rely on their face to make a living and the injury this time is on his face, that is heartbreaking to me. We all feel heartbroken.” Although Kevin was injured, he still insisted to continue and finish the scene first. Are Show Luo and Rainie Yang dating? They were once said to be lovers when they filmed Taiwanese idol series, Hi My Sweetheart, in 2010. Dating rumours between Show Luo and Rainie Yang made headlines again recently after the two Taiwanese artistes shot a commercial together. Said to be in a four-month-long relationship, rumour has it sparks flew between the two again when they played a couple for the commercial shoot. According to reports, the couple displayed no sign of awkwardness and readily hammed it up for the cameras when the director requested for them to be affectionate. Sources revealed the two singers-actors decided to keep their relationship under wraps and away from the media eye due to their “idol” statuses. After Show and Rainie’s turn as an adorable couple in Hi My Sweetheart, they were suspected to be a real-life couple due to their good onscreen and off-camera chemistry. Seen as a publicity stunt by some fans, reps from both artistes denied the claims and emphasised that they are “very close friends”. Rainie and Show were romantically linked with different partners a couple of months later. Before they became friends and “lovers”, the couple had a long-running misunderstanding between them. Rainie’s previous relationship with Show buddy’s Alien Huang, did not end on a good note and left the former a negative impression on Rainie. The couple resolved their issues and misunderstandings after collaborating in Hi My Sweetheart. 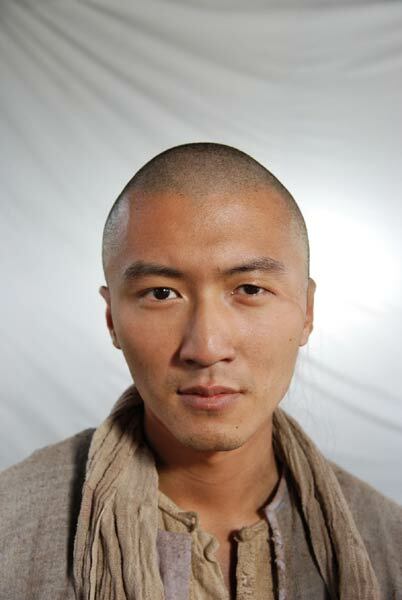 Nicholas Tse appeared in an episode of Tell Maria and shared a secret with the host, Maria Leitao. To everyone’s surprise, Nicholas’s secret was that he had skin cancer. Nicholas had a small mole on the left side of his scalp, and it started to get larger and larger. He went to get it checked out by a doctor and that’s when he discovered that he had melanoma. Last month, Nicholas was admitted to the hospital to for surgery for removal and received 5 stitches. At the time, his mother Deborah Lai accompanied him to the hospital, but his father Patrick Tse did not know about it at all. Have Annie Yi and Harlem Yu reconciled? 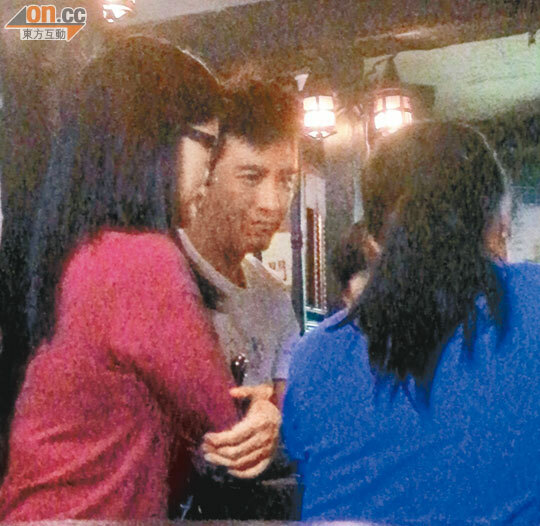 It has been reported that Harlem Yu and his ex-wife Annie Yi and son went together on a family get away. The post immediately raised eyebrows on a suspected reunion between Annie and her ex-husband, famous Taiwanese singer-host Harlem Yu. Netizens speculated that Harlem and their photographer might have been close at hand. In response to the supposed family reunion in Tamshui, Harlem’s manager commented that he was unclear of Harlem’s personal schedule. Annie’s management company said that they were unable to contact Annie at the moment. Harlem and Annie divorced in 2009 after the latter was seen holding hands with Taiwanese actor Victor Huang. 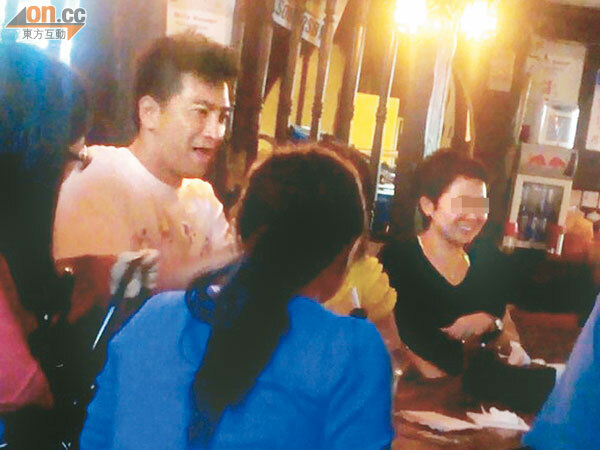 Last week, Kenneth Ma was spotted at a bar in Kowloon Tong meeting some friends and hanging out with a bunch of girls. Reporters spotted Kenneth sitting in the corner of the bar with four girls. With all eyes on him and the opportunity to flirt with the girls, Kenneth lived up to his good boy image and avoided any alcohol. He only had lemon tea the entire evening. All throughout the night, several girls of all ages approached him. Kenneth chatted with some of the women and took some pictures with them. Then at 1am (in good boy fashion) everyone paid for their own drinks and left the bar. Outside the bar, he politely gave the girls goodbye hugs and then picked up his car at the nearby parking lot. Kenneth Ma’s last girlfriend was Nancy Wu and they broke up two years ago. Kenneth has been single ever since and is considered one of the best catches within TVB. Below are some pictures of Kenneth at the bar. You are currently browsing the Asian Entertainment News archives for October, 2012.